Where do I even begin…I’ve felt very ready to talk about London since I crossed the finish line. I’ve carried around my medal all week, like it’s my newborn baby, feeling proud and wanting to tell everyone about my experience. Sunday morning, my alarm went off at 6am. I wanted to give myself time to wake up, get dressed, eat and feel awake and prepared. The charity had organized a coach to collect us from the hotel and take us to the start line at 7.15am. Plenty of time, I thought…yeah right! I said some teary goodbyes to my parents and made my way down to the reception. I’d never felt so alone and nervous in my life. We arrived at the red start and walked to meet the other runners for a group photo. It was great to meet everyone and be part of such a wonderful charity. Throughout the past 6 months, they have been nothing but supportive and there on the end of an email if I had any questions or concerns. Then things were about to get real. It was time to head to the start zone, use the loos and find our starting pen. One of the runners, Nicky, and I decided we would stick together until we parted ways just after we crossed the start line. It was really nice to have someone to talk to and calm each others nerves before we set off. 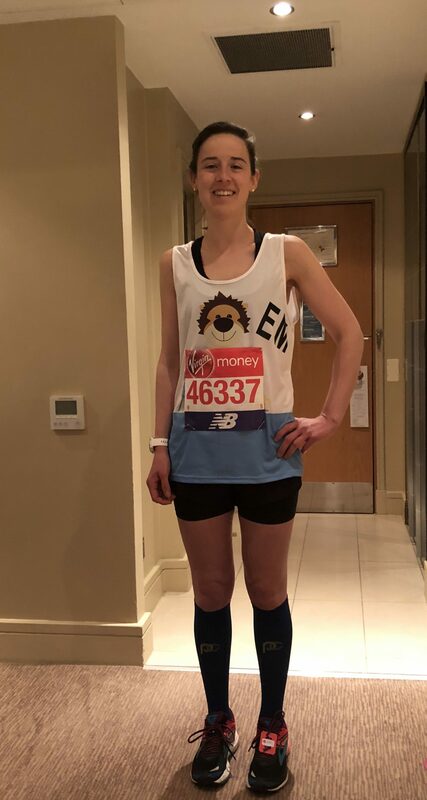 Miles 1-5 – I couldn’t believe the atmosphere as I crossed the start line, the amount of people out cheering us all on was amazing, and I couldn’t believe I was actually running the London Marathon! I had been warned that the first few miles were downhill, so carefully kept an eye on my pace as not to go too quickly or get caught up with racing other runners. At mile 3, all of the starting lines merged, I was running a comfortable pace, and taking it all in. The crowds continued to be thick and loud for the next 2 miles, but the heat was already making me slow. I knew at this point I was going to be running a hell of a lot slower than I had liked, meaning my sub-4 marathon was out the window. My plan now was to take it at a good place, listen to my body and make that finish line. Miles 6-11 – Approaching mile 6 and 7 was brilliant. The course took us around the Cutty Sark, which I’ve not visited, and the cheers and signs were definitely making me smile. I had this in the bag. I felt great, both mentally and physically and comfortable with my pace. The course quietened a little but still the small crowds were cheering strong and at mile 9 I saw my parents and my friend, Becky! This was the boost I needed, I carried on with a huge smile on my face knowing I was about to see my college friend on Tower Bridge and nearly reached half way. 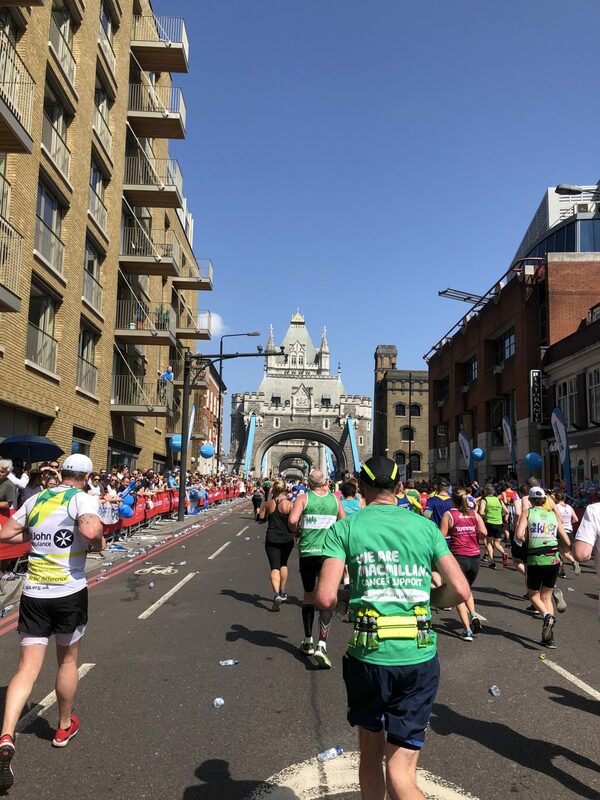 Miles 12-17 – Tower Bridge has to have been my favorite part! The crowds were amazing, the view was stunning and the sun shining strong on us all. I spotted my friend, her partner and their little girl, stopping to give them a hug and kiss before carrying on. At this stage I tried not to get emotional and focused on what was to come. I was very hot and uncomfortable at this point, but so thankful for the showers set up for us to run through and attempt to cool down, even if it was only for a mile or so, as we then became bone dry again! I pushed on through, making my way through the snacks I’d packed in my shorts and bra – literally! The lululemon ‘stuff your bra’ is the BEST invention ever! I also put a good luck coin in one of the pockets, that a good friend gave me before the race. As I headed towards Docklands, I knew this would be the quiet part of the course, which I wasn’t really looking forward to. It starts where mile 21 is, so you can see runners coming towards you on the other side, knowing they were nearly done. Not a great feeling but I dug deep and continued to focus on me. The thing that got me through was knowing I would see my parents, and Becky, again at mile 18. I pushed round, continuing to take water at every station, munching my trusty Clif bar and occupying my mind with my surroundings and giving lots of small children a high five! I continued to feel strong and happy. Mile 18-23 – As I approached mile 18, I perked up, knowing my family were somewhere in the crowds. My dad shouted my name and I instantly ran over to see them and give them a hug before carrying on. I was still smiling, albeit feeling pretty tired and starting to feel a little heavy in my legs. My pace had slowed slightly but I was okay with that. It was boiling hot, more and more runners were collapsing and the medical tents were getting full. I saw mile 20 and thought, right, I can do this. Two park runs then I’m done. By now my knees were starting to hurt, something I had never experienced, and I got slightly concerned. I went on to see a few more friends before reaching Tower Hill. The crowds had picked up, which was a huge relief as I was really flagging. The noise, support and encouragement from complete strangers gave you the most amazing boost to carry on. The finish was so close but boy it felt so far. 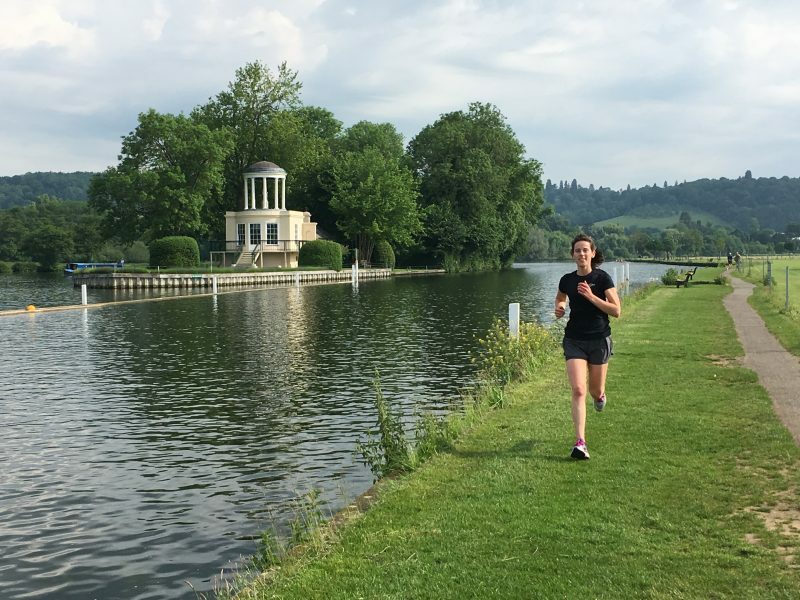 Mile 24- 26 – After seeing my friend waving me through before I hit Embankment, that was honestly one of the few things pushing me on. After standing on the sideline at mile 23 last year, I knew that there would be a lot of people around cheering us on, and I was going to use that to get me to the finish. With that said, it still felt like the longest 4 miles of my life. I was so hot, thirsty and ready to be done. I’d really slowed now and my knees were still hurting. Random people were shouting my name, encouraging me to keep going and I grabbed more water to drink and dowse myself with. Then, just like that the finish line was there, I crossed over the timing pad and I was done. I was almost in shock and couldn’t believe I’d just run my first marathon. 26.2 miles. Wow. 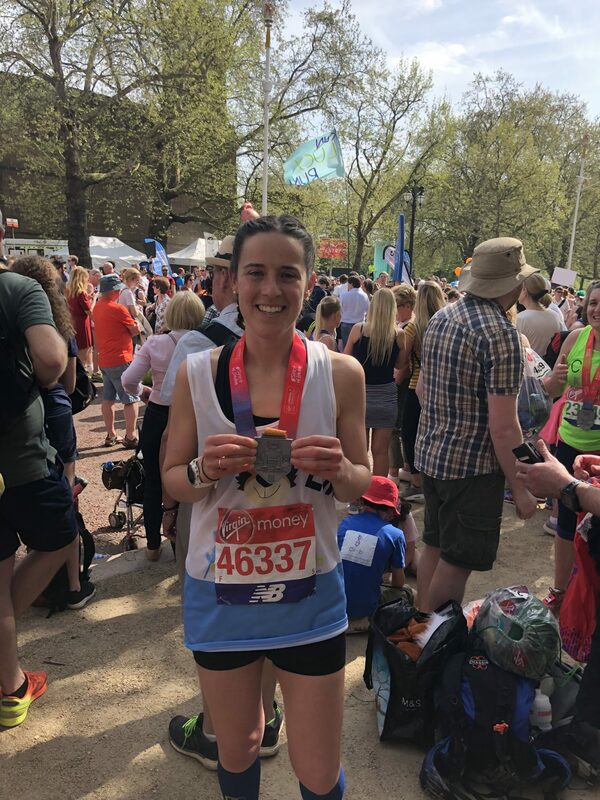 I walked to collect my medal, where I nearly burst into tears at the lady who handed it to me, and carried on to have a very awful photo taken of me by the photographer…! I was thankful to another runner, also running for Children’s Wish, who called my name and congratulated me. We chatted until I met the A and B section of runners meet and greet, and desperately started looking for my parents. Minutes were flying by and I was starting to feel really unwell and upset. All I wanted was a hug. Then I saw two of my good friends, instantly burst into tears and fell into her arms. I was so relieved I had found someone I knew and moments later my parents arrived. I squeezed my mum so hard, I didn’t want to let go. Hugs and congratulations were exchanged and photos taken. I couldn’t wait to sit down and whip off my socks and shoes. We soon headed back to the hotel, where I couldn’t wait to lie down. I wanted to update family and thank everyone for their messages. My dad ran me a magnesium bath – thankful it was super low to the ground, otherwise I’m not sure how I would have got in and out of it! I was SO glad we had a late checkout, the best plan and super thankful to the hotel for arranging this. I got into some comfy clothes, stuck THE best sticker I found in my goodie bag, on my chest and popped my medal around my neck. We heading to find some food and get on the train. 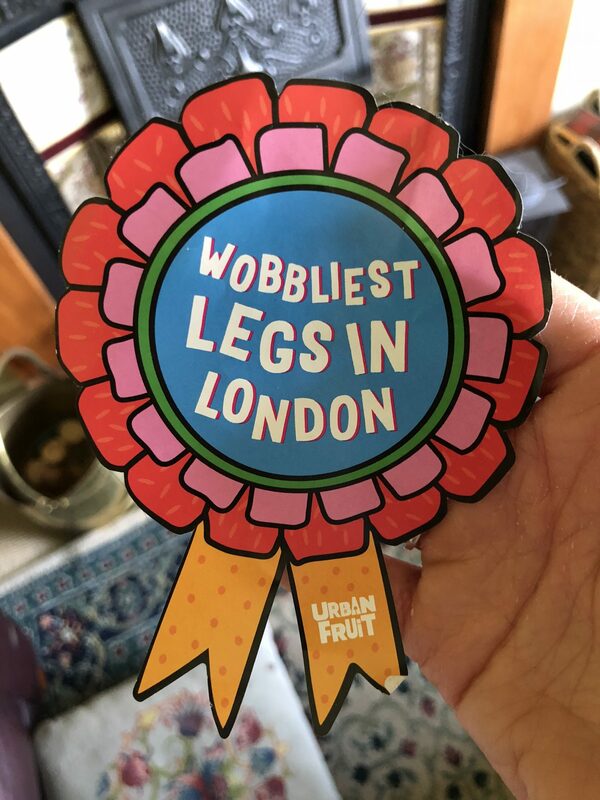 I was congratulated by so many people I passed on our way to Paddington. I can’t describe the feeling but it was amazing. I was happy when we arrived home and I was able to flop on the sofa, eat and go to bed. I had the most horrendous headache, felt very sun kissed and sore. I slowly climbed the stairs, brushed my teeth and climbed into bed with the biggest smile on my face. 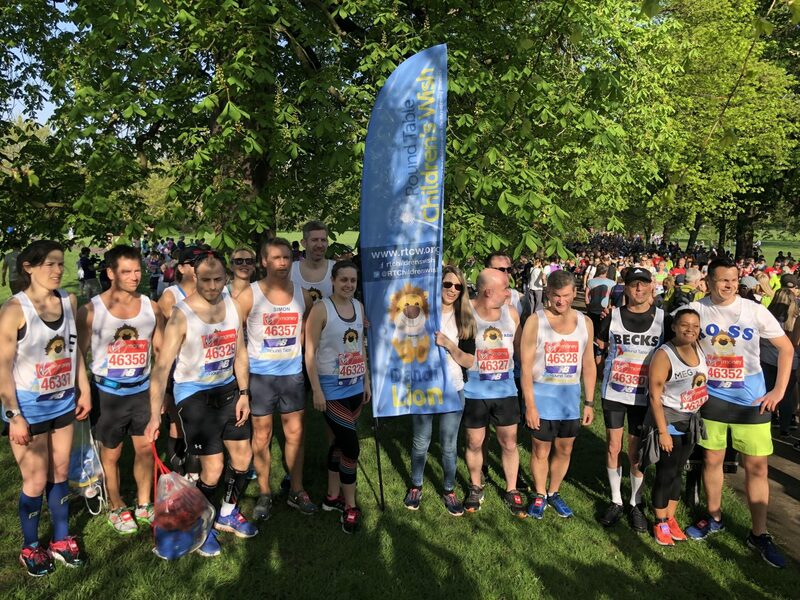 When I told people I was running London, the question was always “what time do you want to go for?” and now it’s “did you enjoy it?” or “would you do it again?”…the answer to both is YES! I’m excited to announce that I will be running the New York City marathon in November and I couldn’t be more excited!! For now, though, I’m going to enjoy casual runs with friends and at events, before my training starts again. Before I go, I want to thank each and every single person who has donated, wished me luck, supported, encouraged and congratulated me over the past 6 months. I never once doubted that I couldn’t raise the required amount for the Children’s Wish Charity, and I’m beyond proud of myself for raising over £2,000, along with all of your help. Thank you, thank you, thank you from the bottom of my heart. Well done Emma, you did so well in the heat. See you at the fairies race!